Roger Deakin wrote in his book "Wildwood" about the forest. "It is where you travel to find yourself, often paradoxically, by getting lost”. If I can extend forest to mean nature, nature that takes you away from the everyday world. It's not magic, it's not an illusion, it is a real feeling that comes about when being surrounded by nature. I'm walking along the beautiful frozen Mistaya River, watching the mist rise as I hear the clear water moving north. Camera in hand taking pictures every few steps. 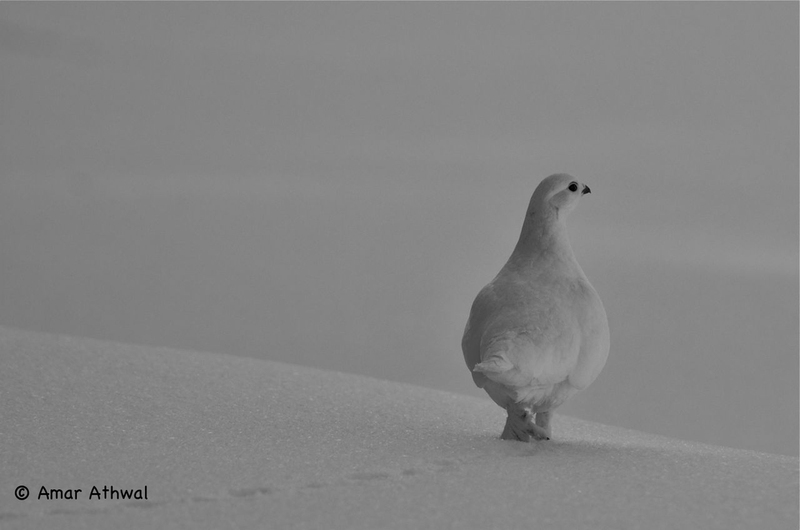 I come into an open area when I hear birds take flight, eight beautiful White tailed Ptarmigans only few meters above the snow that's laying on the ground. The sunlight hits their wings, creating a surreal visual with the surrounding white background. I watch them fly away and land some 80 meters from where they took to air, making a mental note of their landing location. I turn around toward the river to take couple of more pictures before I headed toward the ptarmigans. Just then a Dipper floats to an open area on the river front of me, calls out two notes before flying a safe distance. This where it hits me, this feeling brought about by the snow, the mountains, the forest, the river, the ptarmigans, the dipper, the sunlight and every other part of nature that I was part of that day. A feeling of piece, a feeling of being connected to nature. Its as if the park decided to opened several door at once to see and feel what makes it special. This is what our national parks, and no amount of chocolate can produce it. If there is a evergreen tree for every person who visits the parks, then the needles on each tree represent the moments the parks hold for us. When I was done taking pictures of the landscape, I changed my lens and headed in the direction of the eight White tailed Ptarmigans. If I had not startled them, I don't think I would have heard them as I walked along the river. I took my time as I got closer to where they were, keeping small trees between them and I. They looked beautiful in their winter white feathers, except for one that still had some summer colours. There were to many obstacles in the way and between them as well for me to get a picture of them all together. I focused on them one at a time, in particular on those that were in the open. Taking my time, moving only when I had to, taking pictures after pictures. Watching them foraging for food, while keeping an eye on me as they went about their business. After spending twenty minutes, I decided to move on, feeling refreshed and recharged by nature.